Michael McKeown was the sole senior East Down representative in the City of Lisburn promoted Cross Country event in Moira Demesne on Saturday, a day when most events were postponed if not by the weather then by dire forecasts from the weather men and warnings from the roads authorities to stay at home writes Joe Quinn. In the event just 40 men and 16 women including Crossgar’s Anne Sandford representing the district well as usual but running in the Lagan Valley colours, took to the start line and all deserve credit for putting the rest of us to shame. 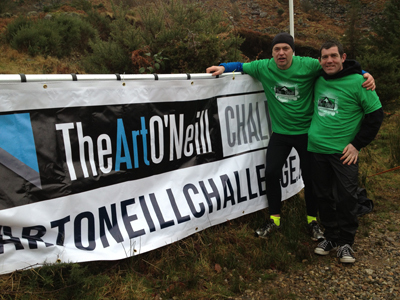 John Findlay and Brian Donnelly at the spot where Art O’Neill died on his 55Km journey. On 6 January 1592, Art O’Neill, his brother Henry, and Red Hugh O’Donnell made a bid for freedom from Dublin Castle. It was the middle of Winter and Ireland was held fast in its icy clutches but they hoped to reach the relative safety of the remote Glenmalure Valley over 55km away. Poorly equipped and underfed they were the only prisoners ever to successfully escape captivity from Dublin Castle but it was an ill-fated journey with Art O’Neill dying from exposure only miles from his goal. Why or how anyone came to remember this event over 400 years later escapes me, but a group calling itself the Great Outdoors decided it was worth commemorating the spirit and endeavour of the three men. The route is from Dublin Castle to Glenmalure Valley, 25k on road and 30k off road. Exceptional night navigation skills are required and the organisers provide guides for those who can’t navigate, which is a bit of a copout considering the absence of this help to the unfortunate Art, but as participants were also excused full replication of his ultimate demise I suppose it’s not unreasonable to bend the other “rules” a bit. Anyway, all joking aside, East Down’s intrepid ultra-runners Brian Donnelly and John Findlay were willing participants setting off at 2 o’clock in the morning on the 55 Km route, but completing more than that due to scenic detours. Brian said afterwards: “It was one of the hardest races I have done due to the start time, conditions both weather and terrain and the fact that almost all the ultra-runners had the advantage of having their own guides. But I recommend this race if you like cold, very, very, very wet conditions with plenty of mud and bog. Preparation is key to finishing successfully along with solid kit selection and food choices for the hills. It is also recommended that everyone familiarise themselves with the route using maps and the grid references before they begin the challenge and do reconnaissance where possible. We didn’t, and that’s why we took the scenic route! !” Both finished in 8 hours 44 minutes, in 29th and 30th places having at one stage slipped down the field to position 62 and 63 respectively so Well Done on a tremendous effort. Meanwhile preparations are under way for the next local event, the Rollercoaster races at Downpatrick racecourse on 2 February around the course perimeter road. This year for the first time there will be races for P3 Boys and Girls as well as P4/5 and P6/P7 Colts and Fillies, commencing at 12.00 noon, with special shields for the Best Boys and Girls P6/7 Primary School Teams (first 4 finishers to count) over a 1,000 metres distance as well as at U/13 (1.5K) and U/15 (2K) group levels in both categories. There will be free soup and rolls for all participants. 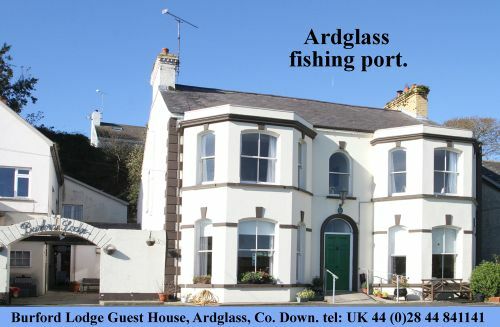 Online entry available now at www.athleticsni.org . Please note that the race will begin this year at 11.00am and not 12.00noon as in previous years, to facilitate the St Patrick’s Day Parade later in the day. Full details next week.